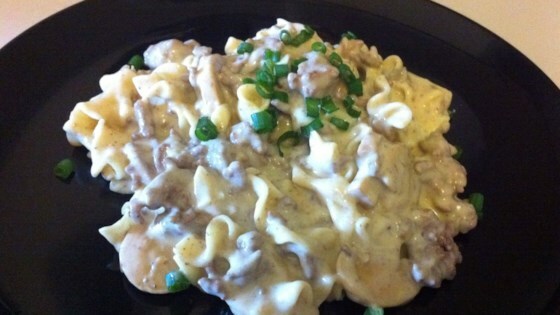 "My family loved the boxed version of this ground beef stroganoff, but we have done away with processed foods. I created this out of necessity, and they don't miss the box at all! It's creamy and delicious!" Heat a large skillet over medium-high heat. Cook and stir beef in the hot skillet until browned and crumbly, 5 to 7 minutes. Drain and discard grease. Combine cornstarch, salt, parsley, garlic powder, and onion powder in a small bowl. Pour cornstarch mixture, milk, beef stock, and egg noodles into the skillet of beef. Bring to a boil. Cover and reduce heat. Simmer, stirring occasionally, until noodles are tender, about 5 minutes. Stir in sour cream and Parmesan cheese; do not return to a boil. I just made this. Super quick and super yummy! Followed the recipe to a T. Very surprised at how good this turned out! Awesome. Instead of onion powder I used a full packet of onion soup. Loved it! Unbelievably easy and delicious!! Will be making this again for sure. Made it exactly per the recipe! Everyone loved it ~ much better than the box version & healthier. Will absolutely make this again!